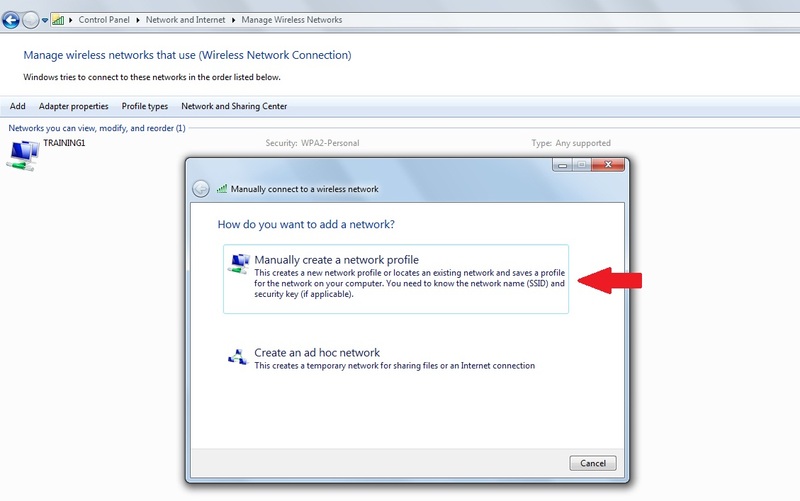 To configure your computer’s wireless network settings, first make sure your wireless is turned on. Next, click the wireless network icon in the taskbar (usually a five bar icon in the lower-right corner of the desktop). An authentication box will appear. Enter your OWU username and password then click OK. Note: you may get a Windows Security Alert stating that “The connection attempt could not be completed”. Don’t worry about this. Click the Connect button. If, however, there’s anything preceding your username, such as “OWU\”, and you’re unable to change it, use the manual way below. 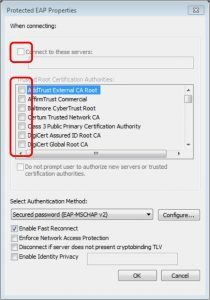 Once the authentication is successful you should have a limited connection to BishopNet. 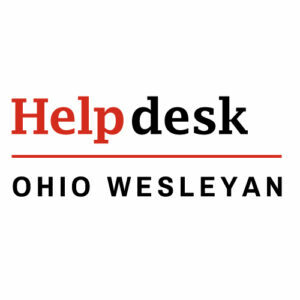 Now open a browser and go to http://wifi.owu.edu/ to finish your registration. You will be asked for your OWU username and password one more time. Click Submit and you should be online with BishopNet in about 5 minutes. 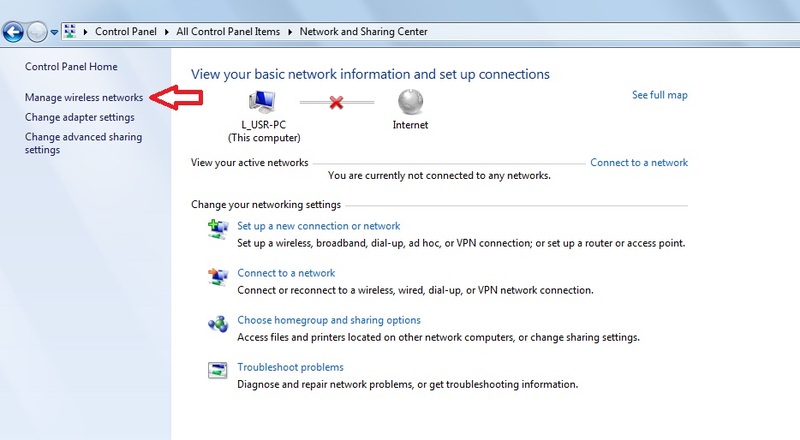 Click the network icon in the system tray at bottom right, by the clock. Click the Network and Sharing Center link at the bottom of the list. Click the Manage Wireless Networks link on the left. 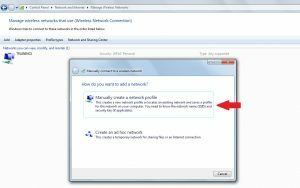 Select “Manually create a network profile”. Enter “BishopNet” as the name. 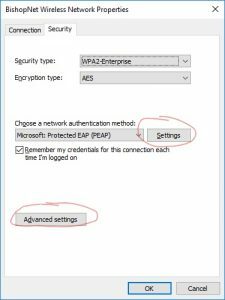 Select WPA2-Enterprise as the security type, and AEP as the encryption type, as in the screenshot below. Click the Next button to continue. 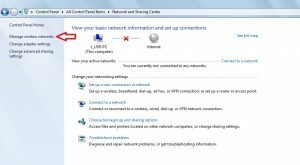 Click the link to Change wireless network settings. 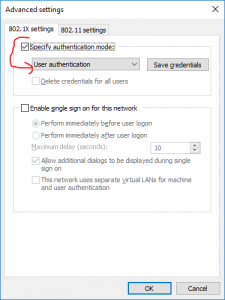 Dismiss any prompts to enter credentials to connect to BishopNet before completing the following. Click the Security tab along the top. Click the Configure… button next to Secured password toward the bottom. 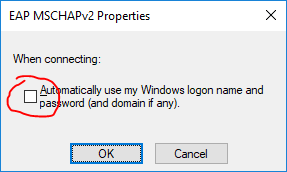 Click OK to close the EAP MSCHAPv2 Properties window. 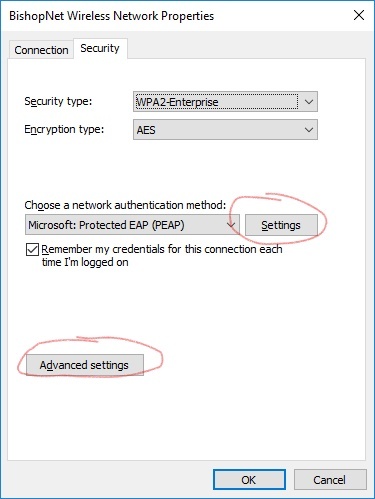 Click OK to close the Protected EAP Properties window. 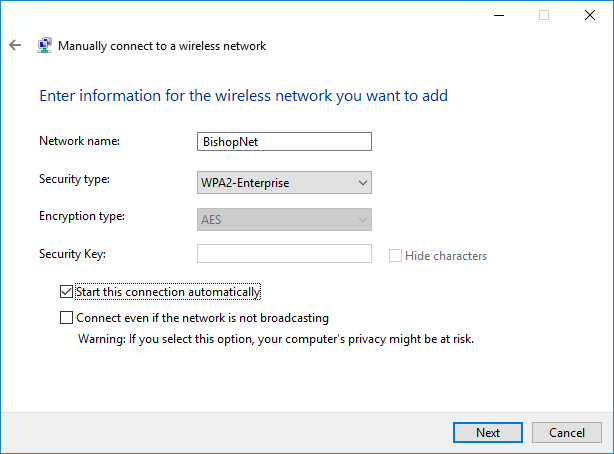 Next, click the “Advanced settings” button at the bottom of the BishopNet Wireless Properties window. 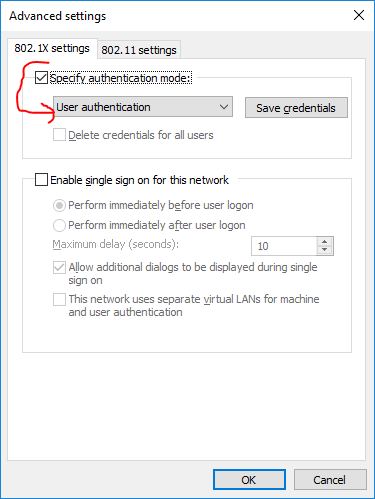 Put a checkmark in the box next to “Specify authentication mode:” and select “User authentication” from the drop-down list. Click OK to close the BishopNet Wireless Properties window. Click the Close button on the final window, and go through the quick, automatic instructions above.